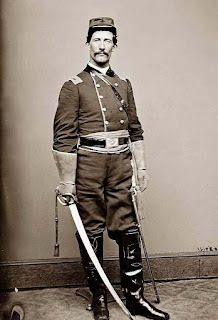 At the end of the Civil War, H. H. McConnell had served in a Union volunteer regiment (i.e., not Regular Army) — he does not say which one — but he had not had enough soldiering. So he re-enlists in the Regulars, trains at Carlisle Barracks in Pennsylvania, and after a few weeks boards a steamboat for Galveston, Texas, with a new draft of troopers for the 6th Cavalry, stationed on the northern Texas frontier at Fort Richardson. Being already experienced, literate, and probably not a raging alcoholic, he is quickly promoted to first sergeant of his company. In 1889, having settled in nearby Jacksboro and served a time as its mayor, he publishes a memoir, Five Years A Cavalryman Or, Sketches Of Regular Army Life On The Texas Frontier, 1866-1871 — my copy was reprinted by the U. of Oklahoma Press in 1996. This is not a book about campaigns and generals, but it is filled with social history — the inside story of how things worked. Is a Spencer carbine missing from the company weapons inventory? Have the company "affidavit man" swear that the last deserter certainly took it with him. • For the first years, the troopers spend less time patroling and more time building or re-building posts abandoned at the start of the war, or altogether new. "Armed laborers," McConnell calls them. Nevertheless, the top brass announce that the Comanches and Kiowas are no longer a menace to the settlers. The surviving settlers beg to differ. Government policy vacillates between a military solution to the "Indian problem" and the "win them over with love" approach of certain Quaker Indian agents. It's too much like Vietnam or the current campaign against the Islamic state. • Not just officers but enlisted men, even privates, are addressed as "Sir" in a very 18th-century style. "Who gave you permission to go fishing last Sunday, sir?" Sgt. McConnell is angrily asked by the colonel in one incident. • They seem to have enough weapons, but not enough horses. When the whole regiment is transferred, at least a third of the troopers march on foot. "Buffalo soldier" reenactor, probably at Fort Sill (US Army photo). The company officers of white regiments have very little of the detail of their companies to bother them — competent Sergeants and clerks are always to be had, who relieve them of such duties. 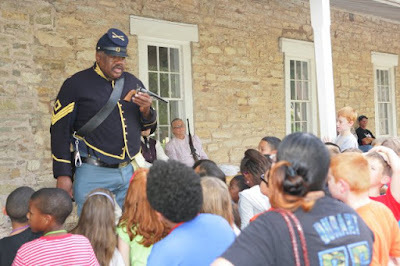 Not so with the colored troops; every detail of duty, looking after their sanitary interests, performing the clerical work, the books, papers, and the thousand and one things that go to make up the routine of life in the service, all must be attended to by the officers themselves. [Because they thus gain practical knowledge and carry more responsibility, this] accounts for the marked efficiency I have noticed among them as a class. I should observe here that the Indians greatly preferred to fight cavalry, or mounted citizens, to fighting infantry, for the obvious reason that, owing to their superior and, in fact, unequaled horsemanship, they had their enemies at a very great disadvantage . . . It took our people a long time to find out that a dozen infantrymen with "long toms" [rifles that out-ranged the cavalry carbines], riding in a six-mule government wagon, were more dreaded by the Indian than a whole squadron of cavalry or [Texas] rangers; but in the last days of Indian fighting or scouting this became the usual mode of arming and equipping parties of soldiers. • One stereotype that he supports is the predominance of Irish immigrants in the Army: "Nearly all the old soldiers in my time were Irishmen (by old soldiers I mean those of fifteen or twenty years service)" and he calls the Irishman "the best soldier in our army." Other nationalities were represented too — many Germans and some French, among others. The Franco-Prussian war of 1870–71 was echoed in the barracks by brawls between the nationalities. The French were "few in number [but] they made up for it in an excess of patriotism." But the Germans had the best of it; the majority of the [regimental] band was from the "Fatherland," and the "Wacht am Rhine" and other of their national airs were played morning, noon and night, to the disgust of the "enemy." After further brawling, the officers "prohibited the playing of the aggravating tunes for the time being." Interesting stuff, no less so for not being that far off. My Texan Grandmother told stories of Indian raids when she was a girl, though I don't know if the Rangers were in play. Nonetheless, her daughter married a "dam Yankee." Great consternation!